Sushi is vinegar rice, topped with other ingredients, such as fish. Sliced raw fish alone is called sashimi, as distinct from sushi. The common ingredient across all the different kinds of sushi is sushi rice. The variety in sushi arises from the different fillings and toppings, condiments, and the way these ingredients are put together. Sushi is made with white, short-grained, Japanese rice mixed with a dressing made of rice vinegar, sugar, salt, and occasionally kombu and sake. The essential quality of short-grain Japanese rice is its stickiness or glutinousness. Rice that is too sticky has a mushy texture; if not sticky enough, it feels dry. It has to be cooled to room temperature before being used for a filling in a sushi. In some fusion cuisine restaurants, short grain brown rice and wild rice are also used. The black seaweed wrappers used for wrapping sushi are called nori. Nori is a type of algae, traditionally cultivated in the harbors of Japan. Originally, algae was scraped from dock pilings, rolled out into thin, edible sheets, and dried in the sun, in a process similar to making rice paper. Left: A sheet of nori. Today, the commercial product is farmed, processed, toasted, packaged, and sold in standard-size sheets about 18 by 21 centimetres (7.1 by 8.3 in). Higher quality nori is thick, smooth, shiny, green, and has no holes. 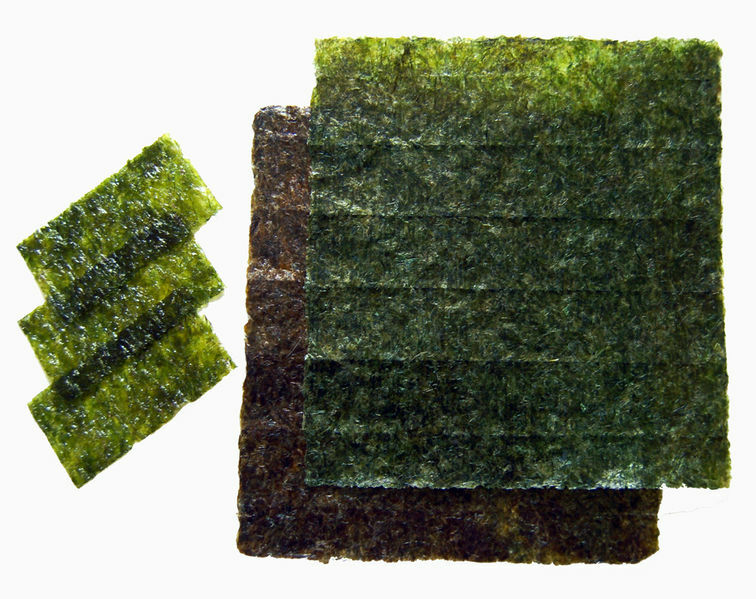 When stored for several months, nori sheets can change color to dark green-brownish. 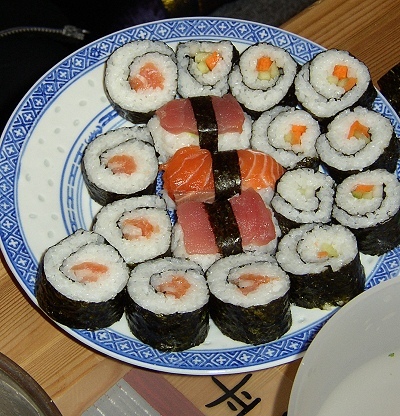 Fish serves as the common topping or filling for sushi. For culinary, sanitary, and aesthetic reasons, fish eaten raw must be fresher and of higher quality than fish which is cooked. Professional sushi chefs are trained to recognize important attributes, including smell, color, firmness, and freedom from parasites that may go undetected in commercial inspection. Commonly-used fish are tuna, Japanese amberjack, yellowtail, snapper, mackerel, and salmon. Other seafoods such as squid, eel, conger, octopus, shrimp, clam, fish roe, sea urchin, crab, and various kinds of shellfish (abalone, prawn, scallop) are the most popular seafoods in sushi. Oysters, however, are less common, as the taste is not thought to go well with the rice. Apart from fish, pickled daikon radish, pickled vegetables, fermented soybeans, avocado, cucumber, asparagus, yam, pickled ume, gourd, burdock, and sweet corn may also be used as toppings and fillings. Tofu and eggs (in the form of slightly sweet, layered omelette called "tamagoyaki") are also common. Sushi is commonly eaten with condiments. Sushi may be dipped in Shōyu, soy sauce, and may be flavored with Wasabi, a piquant paste made from the grated root of the Wasabi japonica plant. True wasabi has anti-microbial properties and may reduce the risk of food poisoning. An imitation wasabi (seiyo-wasabi), made from horseradish and mustard powder and dyed green is common. It is found at lower-end sushi restaurants and at most restaurants outside of Japan. If manufactured in Japan, it may be labelled "Japanese Horseradish". Gari, sweet, pickled ginger, is eaten with sushi to both cleanse the palate and aid in digestion. In Japan, green tea (ocha) is invariably served together with sushi.